Urban Bush Women, "Hair & Other Stories"
Urban Bush Women's uniquely bold and boundary-pushing storytelling weaves contemporary dance, music, and text with the history, culture, and spiritual traditions of African Americans and the African Diaspora. 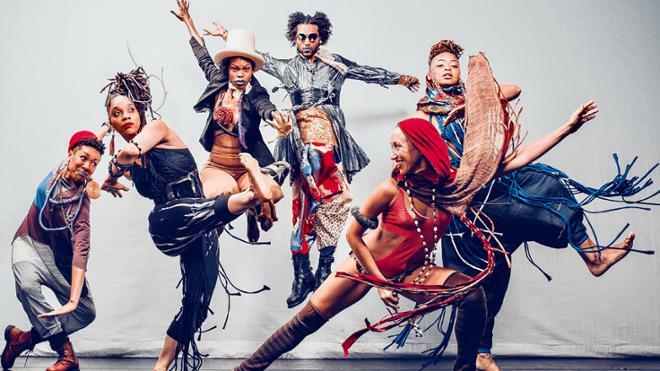 Choreographed by Associate Artistic Directors Chanon Judson and Samantha Speis, Hair & Other Stories explores disquieting perceptions of beauty, identity, and race and what constitutes the freedom to rise to our Extra-ordinary Selves in extraordinary times. Crafted from personal narratives from our communities, kitchens and living rooms, social media, as well as YouTube, Hair & Other Stories is a two-and-a-half hour experience that blends dance-theater and conversations to challenge existing American values and celebrates our choices around “who we be” and “how we do!” Don’t come here for no show: we’re goin’ on a Journey! Arrive early for a pre-performance discussion with the members of the company led by VCU professor of dance Gaynell Sherrod at 6:30 PM. Join us in the theatre lobby after the performance for an after-party with a DJ, dancing, refreshments, and an opportunity to share your own hair story. This engagement of Urban Bush Women, Hair & Other Stories is made possible through the ArtsCONNECT program of Mid-Atlantic Arts Foundation with support from the National Endowment for the Arts. This performance is also sponsored in part by The E. Rhodes and Leona B. Carpenter Foundation and the The Cultural Affairs Committee.